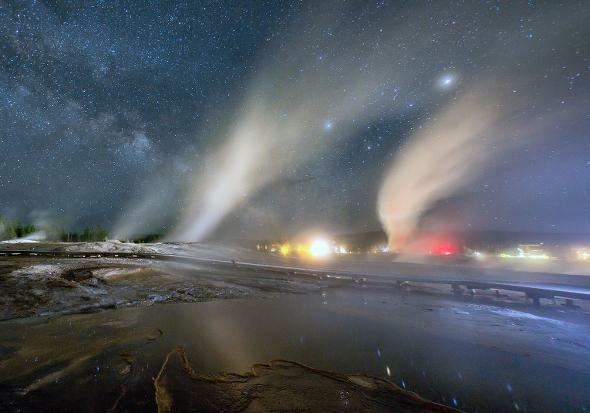 Time-lapse video by Harun Mehmidinovic of Yellowstone Park. Geysers and stars over Yellowstone, from the video. Getting an email from Harun Mehmedinovic is always good news: It means he has a stunning new time-lapse animation of the night sky he’s made. SKYGLOWPROJECT.COM : HADES EXHALES from Harun Mehmedinović on Vimeo. It’s a testament to Mehmedinovic’s skill that while I’m usually riveted to the sky in these videos, in this case I hardly saw it. I was too busy holding my breath watching the incredible landscape. I was particularly interested in the geysers. The plumes looked odd to me, like they were superimposed over something dark … and then it struck me that what I was seeing were the shadows of the trees on the plumes as they billowed by! That was a fun moment; that split second when you feel off kilter, then suddenly understand what you’re seeing. It’s a little slice of scientific inquiry (the “aha!” moment that happens all too rarely) encapsulated in art and even more science. I’ve never been to Yellowstone, and that’s an oversight I’m keen to fix. I very much want to see the boiling pits of minerals and chemicals brought to the surface by geologic activity there, and watch the dark sky through a plume for myself. I do so love geology, especially when astronomy is thrown into the mix as well. By the way, Mehmedinovic does this as part of the Skyglow project, a crowdsourced effort to bring attention to the effects of light pollution on dark skies in North America. I urge you to watch the other videos he’s done for this (especially the one of Dry Tortugas Park), as they are all amazing, and truly deliver the beauty of the sky and the Earth.